J'aurais dû manger plus tôt. I should have eaten earlier. Tu aurais dû fermer la porte à clé. You should have locked the door. Elle aurait dû freiner plus tôt. She should have braked earlier. Nous n'aurions pas dû l'écouter. We shouldn't have listened to him. Vous auriez dû la prévenir. You should have warned her. Ils auraient dû prendre le bus à la place. They should have taken the bus instead. This phrase came up in a test where I had to fill in the “should have” segment with “partir” ...should have left. I hesitated because I was thinking “partir is a House/être verb. Please instruct why être verb rules don’t apply in the case. Because partir is not really relevant here, it's the conditionnel passé of devoir, which is not a "house" verb, and so always uses avoir. It doesn't matter what kind of verb comes afterwards. Do these phrases have the same meaning? « je devrais allé » & « j’aurais du allé have the same meaning? But does « je devrais allé ‘ (using past participle of aller) mean the same thing as « j’aurais dû aller » ? 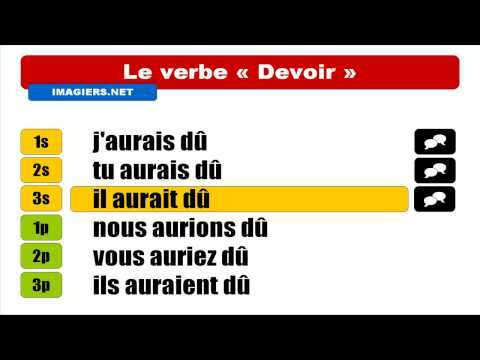 Je devrais aller = I should go , is describing an action in the future which could still happen. J'aurais dû aller = I should have gone , is describing an action in the past which ought to have happened but didn't and it's too late. Do you think this is a common spelling error in French, or is there some other reason? Thank you, Alan! Nope, it’s not a spelling error. I just need a native speaker to tell me if “ je devrais allé” is ever acceptable because some online translation tools say yes. It's true that Google Translate, for example, will translate "Je devrais allé" as "I should have gone", but it will always attempt to give an answer, even if the input is incorrect. If you do the translation in the opposite direction it gives "j'aurais dû aller" instead. Have you seen examples of "je devrais allé" in print? Or have you heard people saying this? I have heard someone say it, but it was not a native speaker. So I looked it up online and thought, hmmm, maybe ? Thank you very much for your help and thank you Cécile ! Maybe the confusion also comes from the fact that ‘allé ‘ and ‘aller’ sound the same? Two possible conjugations in Le Conditionnel Passé? Bonjour Oleg ! No, they're not interchangeable, as the second form is used only in very formal writing, and is extremely rare nowadays. I hope that's helpful! À bientôt !